Come for the Wine: What's Your Rhône Name? Submitted on behalf of the chief glass buffer of the Rhone Rangers. Thanks for such a fun, great post Marcy! As a member of the Rhone Rangers, its much appreciated! I'd also want to let attendees know this is the first time the Rhone Rangers will sell wine at the event. You can buy and take delivery of wine at over 60 of the 100 wineries pouring, and take it home with you. We will also have 2 checkpoints so you can drop off your purchases and get them later. 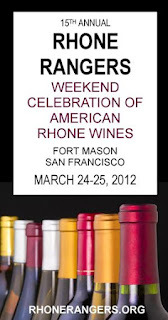 A whole weekend of Rhone wines - can't wait! Cheers - William aka "Flash Grenache' (Blanc) ! All of these names are so awesome-- all together the sound like the cast of a romantic comedy or especially a French bedroom farce. Ohh La la! Cool name indeed. Thanks for stopping by Grace. Winner will be selected by random draw but I'll leave your name off the list. You are all winners in my book!